My husband and I love to travel. We didn’t want to stop traveling after we had kids. One thing we did notice right away is that once you have little ones you need more space. That great 4-star Hotwire deal doesn’t really work for families. Being squished in a hotel is not our idea of a good time. That’s why we started renting Timeshares from owners once we had our daughter. You are never bugged to go to a Timeshare presentation because everyone thinks you’re an owner! 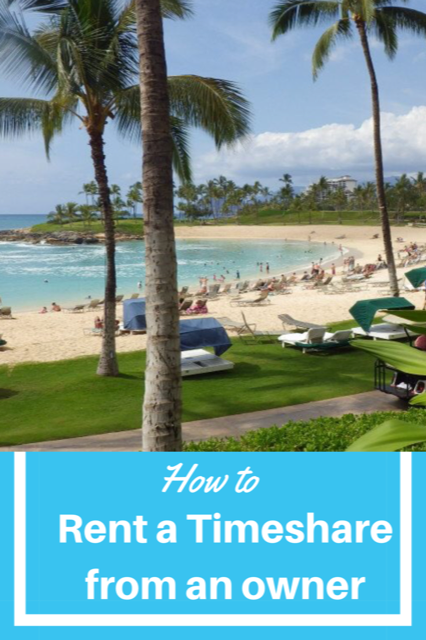 Renting a Timeshare from an owner is easy. It gets even easier once you’ve made connections with a few owners and can keep their information handy for future travel. Here’s how you can rent from an owner. We’ve had so much luck with Marriott, Hilton and Wyndham resorts. I always use TripAdvisor to get reviews of resorts before I start contacting anyone. My go-to site is Redweek.com. It has the most listings and the prices are fair. You have to pay an annual fee to use the site but it is well worth it. Find a few properties you’re interested in and start sending in your requests. Owners are usually very quick to reply. Don’t be shy to ask what the rental includes (parking is a big one). I usually book my resort before booking my flights. I’ve always had a little wiggle room in the final price of the rental. I usually save $100-$200 off the listed price of the accommodation. Bottom line is, it doesn’t hurt to ask. Remember that there are sometimes added fees that the owners have no control over. Paypal charges a fee and resorts often have a small occupancy fee that you pay them upon checkout. This is a big issue for me and it should be for you too. It’s always a good idea to phone the owner before booking and have a conversation with them. I also always require the owners full name, address and phone number before booking. I then call the resort or the vacation club office of the resort to verify that they are indeed owners. I have never had an issue getting this information from both the owner or the resorts. I have always used Paypal or my credit card to pay an owner. Once you have booked with an owner you should receive a confirmation code right away. I always phone the resort immediately after booking to make sure that everything looks good and my reservation has been made. All that’s left to do is sit back and enjoy your holiday! Once you rent from an owner you’ll never go back to booking a regular hotel room. Have you ever rented a Timeshare from an owner? What was your experience like? we have used redweek.com several times, always a great experience. We booked Ko Olina too through redweek in 2013. Amazing resort, accommodations and beach oh and did I mention that Costco isn’t too far away! Something to look into. My cousin and her husband own a couple timeshares… would definitely be worth looking into. Thanks!